Kabuki is a traditional play. 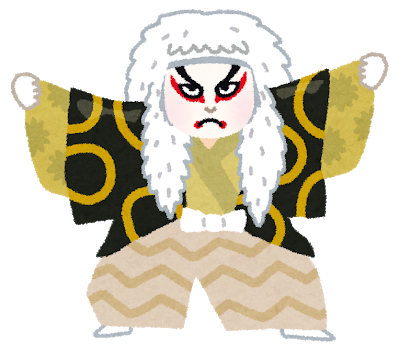 Originally, a woman called Okuni started Kabuki Dance in the 17th century. It developed into Kabuki and became very popular. and banned women from performing Kabuki. Since then Kabuki has been played by only male actors. Female roles are also played by male actors. Kabuki consists of music, dance and acting. Kabuki makeup is called Kumadori and it expresses their characters. Kabuki costumes are very elaborate and spectacular. Kabuki stage is really unique. Mawari Butai is a setting that can change the scene in a moment. Seri is an opening on the stage from which a Kabuki actor comes out. Hanamichi is a long stage like a bridge that streches toward the audience. The earphone guide is available for non-Japanese visitors to help understand Kabuki in English.